Using up all the mini skeins; well, a lot of them anyway. 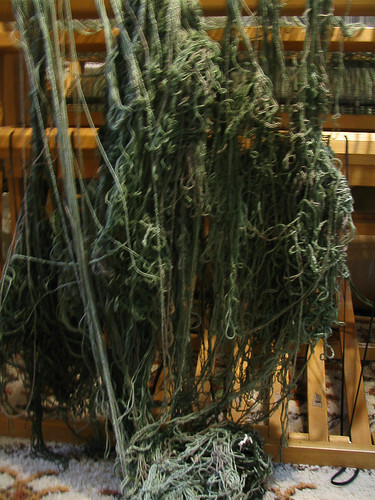 Weaving uses a lot of yarn. 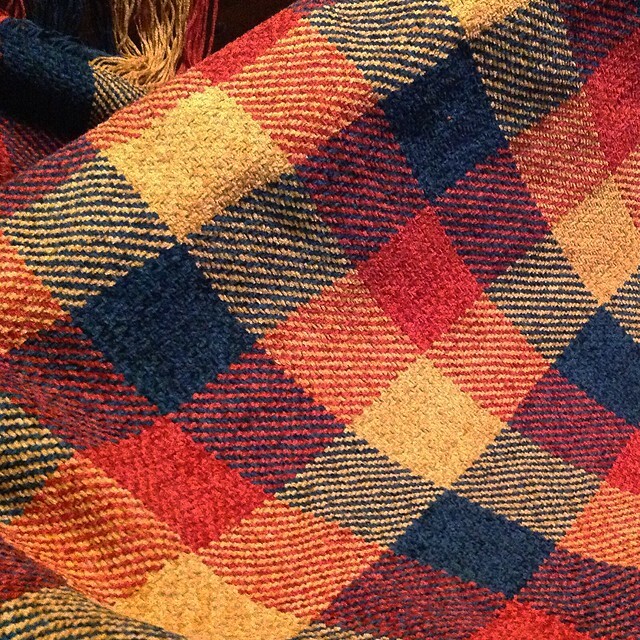 I have no idea how many yards I wove or if it was just supposed to be a blanket. The dye is sapphire blue. You can see the difference in lighting on the effect of the color. It really is a sapphire blue, not navy. I really need new light fixtures, not just bulbs. I started this in May 2017. For me, that's pretty good. The end is in sight. I will see if the first, mostly blue and white section is long enough for a shawl. I plan to overdye the white in more blue. The natural colors I'm leaving alone. I should be able to get a 45" square lap blanket out of those. 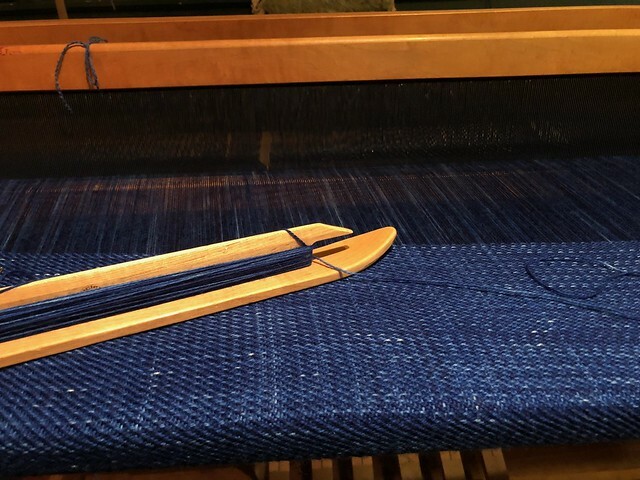 I worked really hard this week to get this woven. 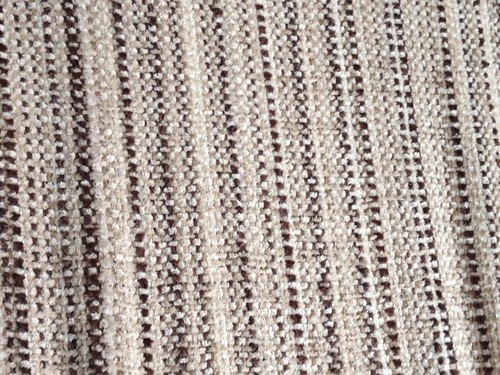 And it came off the loom today! It could be a large shawl or a throw. Its about 41" wide and over 72" long. I will measure it officially after its been blocked. I dyed wool and have another ready to be warped shortly. I have some finishing work to do on the first large shawl before starting the second. After that, I rethread the loom for leg wraps. They are not challenging or even interesting but they should help pay the bills. Hockey season is wrapping up and I want to get as much done as possible before Lord Stanley dances. I listen to games while I weave. We follow both the Blackhawks and the Penguins. Without TV, its easier to work to the radio or livesteam radio. Meanwhile, I must make Viking hats for the upcoming Viking Festival in Ashville, OH at the end of the month. One almost done. We'll see how many I can finish before repetitive stress trashes my arm. The good news is I sold all but one at Gulf Wars. The bad news is I sold all but one at Gulf Wars. Must make stock toot sweet! Been busy trying to get projects finished. I've a cardweaving project been sitting around too long. I worked on that during the Blackhawks game last night. Maybe I got another 8" done? It has a huge warp for such a tiny band. I also managed to flip some cards so that took a while to undo. Light blue 10/2 cotton, single diamond, it should make nice trim. I've no idea how long it will be. 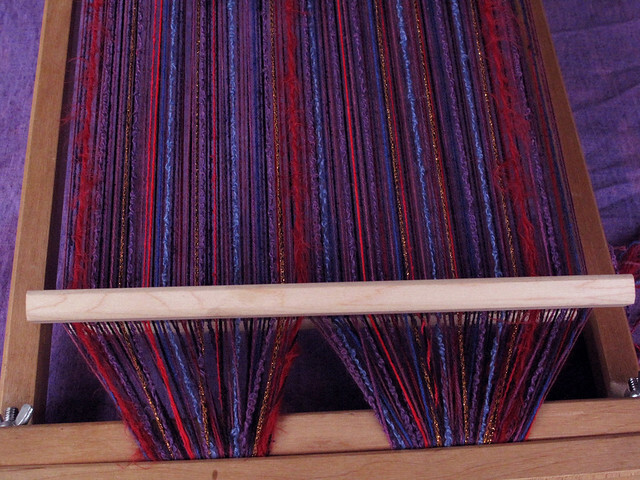 Trying out one of Eguill's looms so I can honestly say what I like about the loom. It was the first time using bone cards too. The only down side so far is my shuttle is busted and the weft unwinds continually. Time for a new shuttle soon. Maybe Herveus can fix it. It's one of his persimmon wood shuttles. It's so smooth and has a nice edge. Inventory is inspirational. I saw some colors together and had to play. So I'm warping another loom. It's going to be a cardwoven belt. This time I am trying out Eguill's laser cut wooden cards. I'm excited about that. This project is going on my left-handed Herveus inkle. I need to poke around and see what shuttles I have in my bin. Not using the busted one again. I remember a cedar shuttle that I glued back together. Yes, I keep dropping shuttles and breaking them. Anyway, the belt will be purple and green. 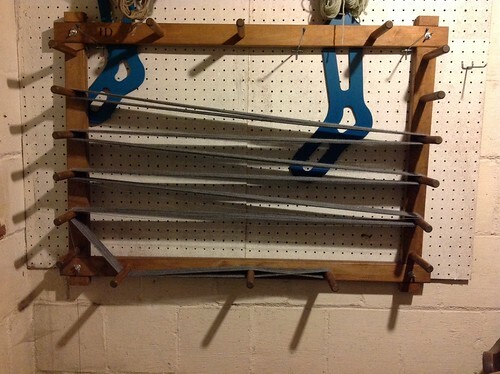 And I am slowly working my way across the four harness Schacht loom with a project I wanted to do for about 10 years. It's just a throw out of cotton chenille. I've had the yarn a long time. It's going to be checked in red, gold, and blue in a simple twill. It will be a while before these projects are done but the joy is in the journey. Snails are out running me at the slow pace I set on inventory. Most of the store stock is done. 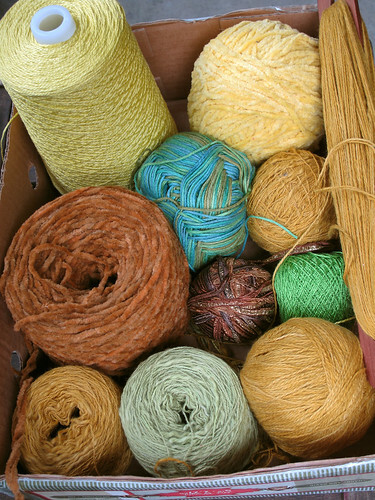 Five boxes to go of weaving yarn and fleece. Then I go through looking for items that somehow got missed. The end is in sight. 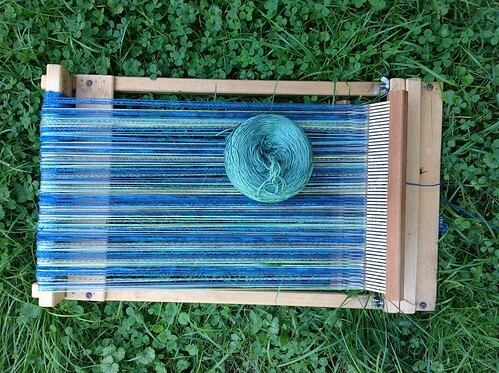 Meanwhile, I pulled together another color palette for the loom, green/yellow/ blue. Pictures once the temperature is above 20°. I am waiting to get started on the custom scarf. I gave my client three options for a weft. 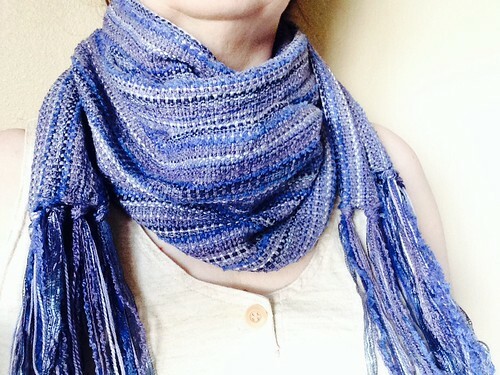 The weft can totally change the complexion of the scarf. I start with a palette. This palette pushes my creativity. The client chose the colors. I then dyed the yarn. 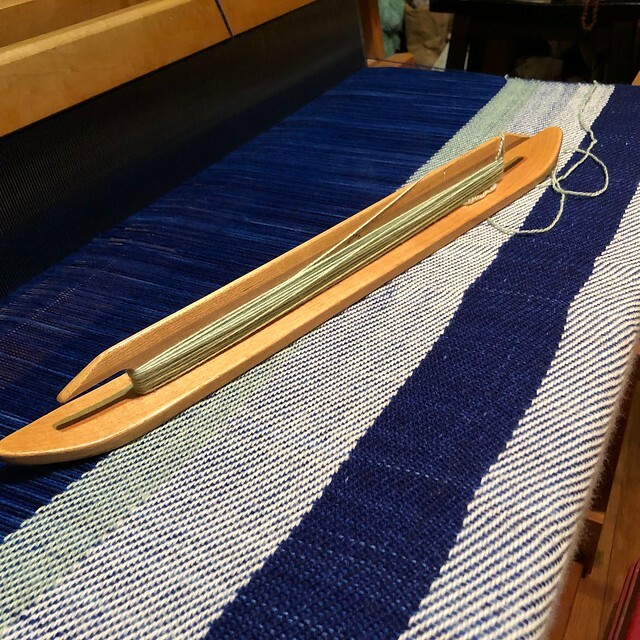 Then I warp the loom. These are the weft choices. 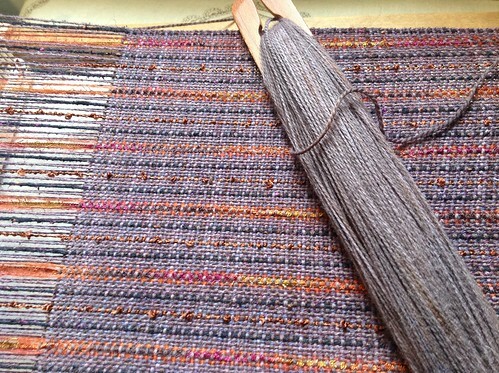 I have enough weft to finish a scarf in each of these colors. The bottom one is my favorite. It gives a nice balanced weave, will drape well, and I totally did not expect to like it. That is the reason you need to swatch. Meanwhile, I finished another hat. Gulf Wars will be here before I know it. I ordered new stock so I must be done with inventory before it arrives. Winding yarn is next after inventory. 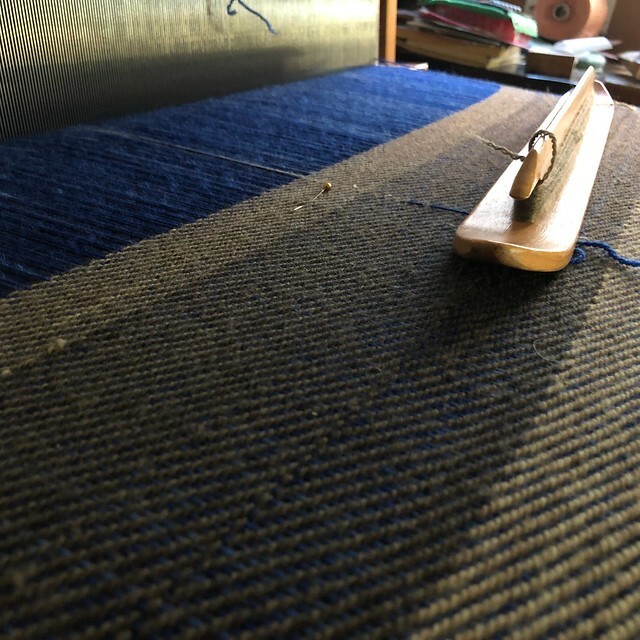 Part of weaving clothing items is having to figure out percentages of fiber content for the labels. And I'm pretty good with record keeping. I kitted up a bunch of scarves to weave in Grand Rapids. I wove 3 or 4 scarves and am now doing the paperwork on the computer. But for the life of me, could not remember the name of one yarn, a specialty navy blue ribbon yarn. I have over 400 yarns in tubs so I keep a log book of labels and a small sample of these yarns. The last time I laid eyes on that log book was during inventory in January. Needless to say, there was a mad scramble today. I organized the attic desk. Went through every three ring binder. Recycled LOTS of paper and old catalogs. Not there. Okay, so maybe by the scale where I do inventory? I have a small bookshelf the sits up on the cupboard next to the scale. Again, I went through every three ring binder. I found books I didn't know I owned. I found the knitting stitch dictionary which I need for one of my ravelry sweaters. Nothing. Okay, what about the big oak desk? It has many nooks and crannies for things to hide in. I cleaned out those nooks. I found the original MS CDs for the computer. I recycled the old Dell manuals, along with ancient bank records (shredded). Oh the dust! Maybe underneath the desk? I have event contracts from 2006 to 2009. Recycle. More dust, bird seed, and oh my! A whole cone of red cotton. Very dusty! Gotta find some tape and clean that one. Vacuuming ensues. My, the room looks nice! Since there's no three ring binder, maybe I just look over my books and see what's worth reading. Wait a minute, what's behind the bookshelf? Yup, the missing log book. So the answer to today's pop quiz is Giglio. 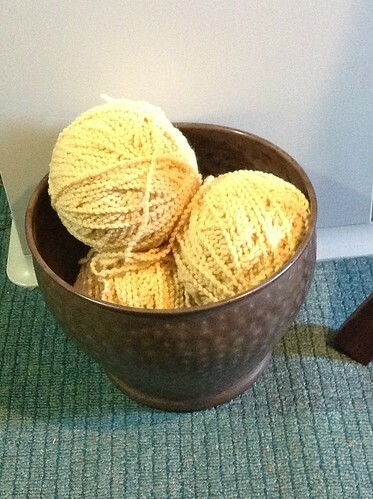 Yarn has been summarily weighed, logged, and put away. 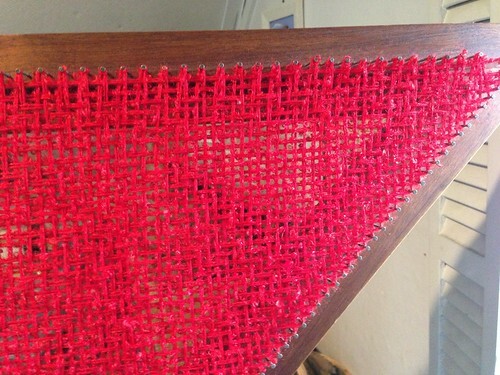 The next project on the loom has been started. Since it's Labor Day weekend, I'm calling it the Last Summer Fling. It has a surfer feel to it. Watch those rip tides! I was going to look through all my books for lozenge documentation as well as thread count. This nice lady did it for me. It's what I warped my jack loom with. Mandy was explaining to me why broken pointed herringbone was done more frequently. She said its more natural on a warp weighted loom. I need to pull out my copy of that (the Warp Weighted Loom) and read it more thoroughly. I have enough looms and don't really have a desire to make or weave with a warp weighted loom, but the circular loom has always fascinated me. 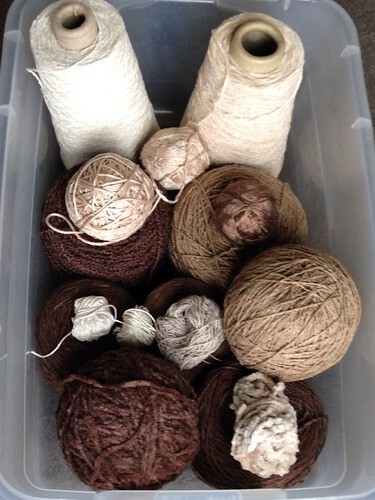 Before I start playing with hemp and linen, I want to do some research. I realize there are very few finds with bast fibers. 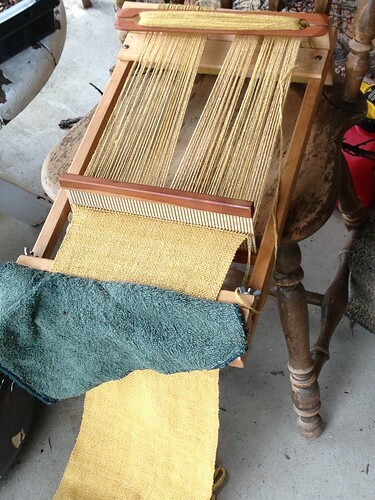 Stretch goals: setup my Mountain Loom with a period weave for bast fiber. Look at building a circular loom for weaving bog dresses. Although the image of loved ones gathered together at this time of year is a wonderful romatic notion, the reality is never as picturesque as Currier and Ives captured it. Our house is small and made smaller still by inventory about waiting to be counted, projects in various stages of completion and three individuals on different time schedules. Still, no one has killed anybody yet. The weather has turned cold and some folks are in pain. Hopefully we will all survive to greet another year. Inventory is almost halfway done. Some involves counting but more involves creating displays for the next event. The incessant ball winding will continue until stock is depleted. The incredible windstorm is over. The temperature has dipped once again. And the five year project is off the loom. It was only supposed to take a week tops but then I was attacked by tangle fairies. Pardon the bluriness. The tangle fae were moving too fast. A year later, the strings were fixed. 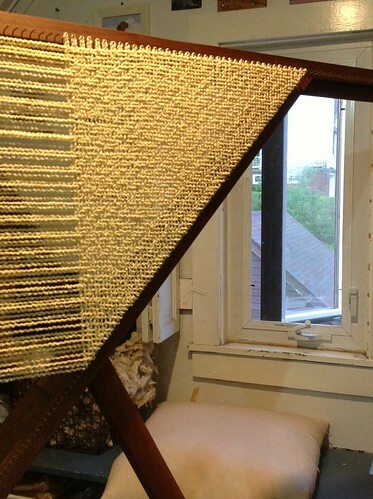 But then the loom became a table, piled high with yarn to wind, fleece and other projects. 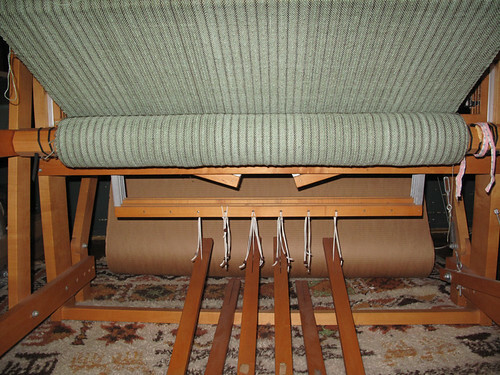 Frequently, the loom was a laundry folding table. Over six pounds of fabric, about 11 yards, four different wefts. We'll see how long it will take to make these into sellable garments. Hopefully not another five years. Only the next one will be dark brown with highlights of cream. I had this planned in Oregon but didn't get far because of the nursing home releasing John early. I got a little ways warped before I had to make lunch for everyone. When I got back to my workroom, I got sidetracked by fleece. I inventoried a tub of assorted colors. 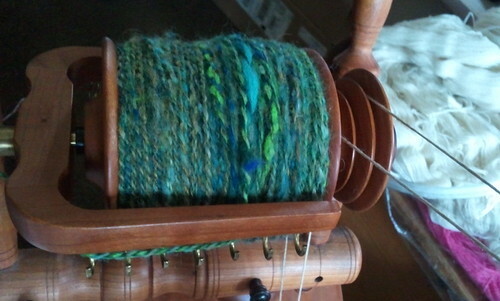 I was so enamored with the yarn that The Dudley Spinner had made that I wanted to spin something fierce. We'll see how this one goes. Finally I have bunches of projects going simultaneously! 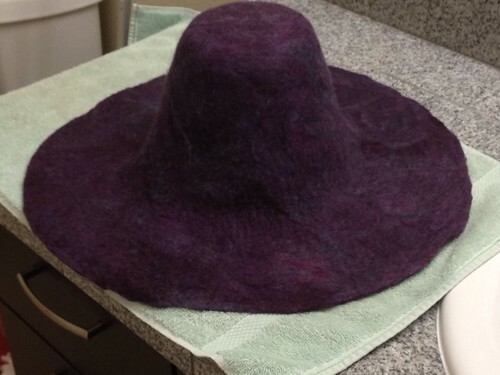 I started knitting a gold hat, I have weaving on the loom, and another wet felted hat in progress. I have products ( buttons and clasps) to label and put onto cardstock. I made quiche today, did dishes, added items to etsy, and had a good night's sleep. Yay! 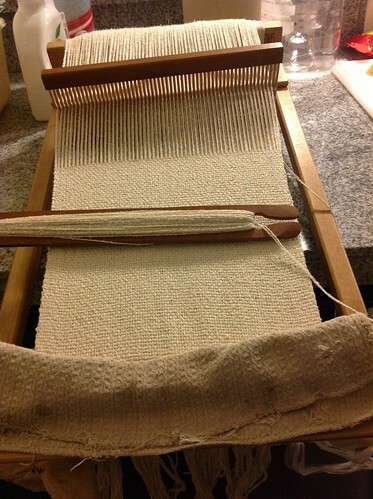 And the finale was to wash the silk handwoven scarf and start eco-printing it. I pulled all the oak leaves out of the bag in the fridge. The wind has gifted me with a nice collection. I took the steel wool soaking in tea and added the fake egg whites to dip each leaf. The mix was black. 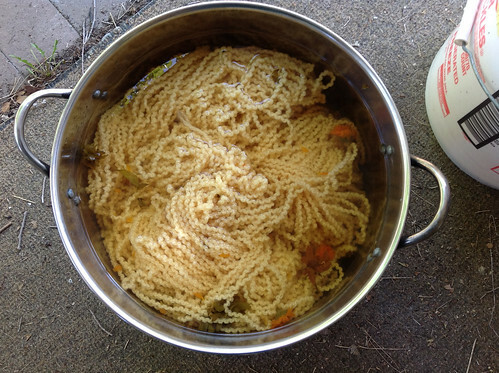 The scarf got a pre-soak in salt water. I dipped and placed my leaves and covered them with muslin. Then I took my shoe and hammered all down the line. I took apart my drop spindle and used the dowel to roll it up. I stuck it in a plastic bag. Since there won't be sun here for days, I stuck it in the microwave for a minute to heat it at a low temp. I do this periodically. Going to leave it there for a couple of days. Hoping to go for a walk on trail somewhere out here in Oregon and see what I can find. I have raw silk to weave with. At the moment Oregon has sun. I might take a page out of jshubert's book and go out to the ocean for my salt water. This will help my soul to sing despite the current predicament. But the dreams are telling me there is work to be done and a show to travel to. I have to try to finish existing projects because I am an artist easily influence by sight, smell and sound. 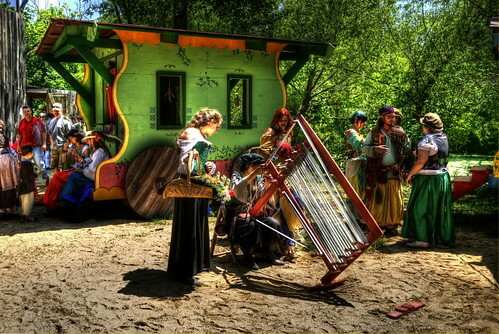 Once I have spent two weeks at Pennsic, my mind will be in a vastly different space which makes it really hard to pick up where I left off. I finished the teal loose weave shawl/scarf. I need to finish the buttercream which was in turn derailed back in May by Art in the Garden. The carding fleece has stopped. The fleece has been put away for now. After Pennsic, I hoped to get back to spinning grey sparkling lilac to ply with Noro for a shawl. I also started a scarlet shawl for Beth, only a year overdue. 20 + 12 + 8 nails so far. Herringbone. 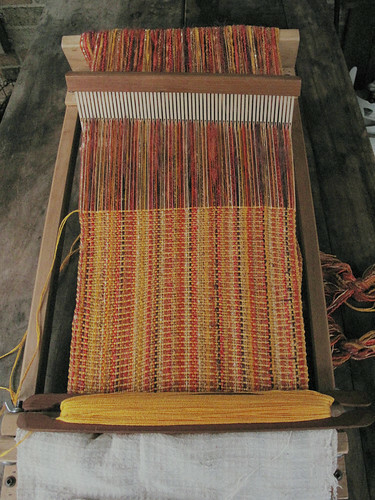 Largest setting on loom. 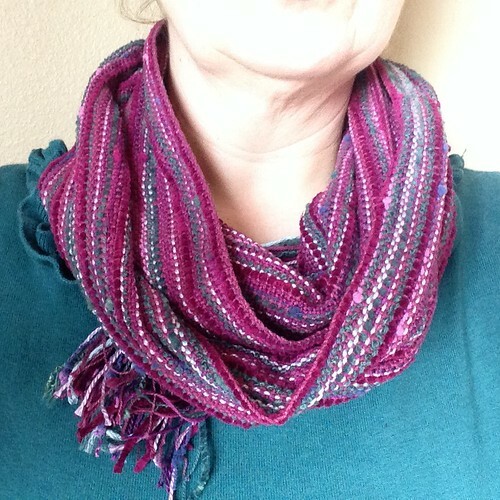 The Beka loom has an eco printing scarf on it. It's plain weave, raw silk, naturally dyed in alum and osage orange. I want to imprint black dahlia's on it. As it cools down for the evening, I need to find empty totes and start packing. The basement is also an extracurricular project needing my attention. Must wash clothes and fill water bottles for the freezer. Also must update my website links page to include some newer ideas. Home again, home again, jiggety jig. Today and every Thursday until October is the Farmer's Market. We actually went to two. After dropping off packages at the post office, we headed to the bank and then over the border to Upper St. Claire's market. Upper St. Claire has a little more wealth than most communities. They have organics usually. This time, there were a lot of prepared food vendors. Not my thing with all my food allergies. Since my discovery earlier this week (spagetti makers are now adding soy in the form of Xanthum Gum), I was delighted to see Mia Cucina, our local gourmet pasta maker. Also picked up organic lettuce from Bluebird Farms and some soy free breakfast fruit bread. I was hoping that Clarion River would be there for meats and grains but no go this week. Then off we headed to Washington's Main Street Farmers Market. The rain beat us there but the friendly vendors hung around and showed us their more diverse wares. We picked up Fair Trade Olive Oil and Chocolate from the Presbytarians, Basil plants in three different flavors from a local grower, Strawberries and Potatoes from another local farm, and had a lovely discussion with the Master Gardeners from Penn State Ag Extension. I like Wahington's market better but I like my organics which they don't have. And the other nice thing about Washington's market is that it's right near the library. So of course we had to stop in! I picked up two books and realized how much updating I need to do for Goodreads so I have a clue what I've read already. Finally the library has entered the latter 20th century. The county was able to implement a system to include all the libraries in the county. Previously, it was individual townships and you needed multiple library cards, one for each town. So we got new cards today at the library and can use them at any of 15 or so libraries. Yay! I can finally throw my ancient paper library card away. Then on to pickup the necessities, cat food and bird seed and litter. Finally home to put away all the goodies. This morning and late this evening, I got more work done on the buttercream shawl. 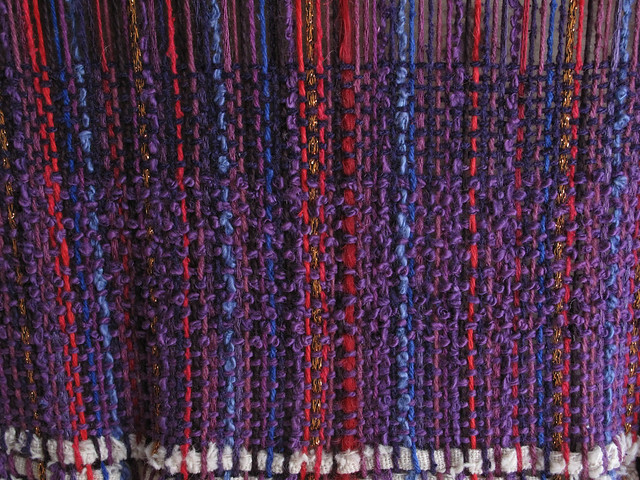 I want it off the loom so I can play with other colors. It's almost done, maybe two to three more hours. I dreamt I did an art installation. 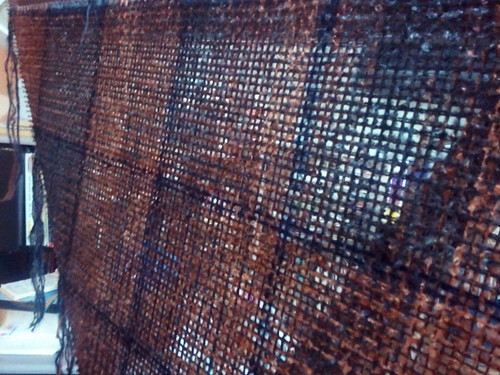 I had woven perfect cubes and had them hung at various heights by a thread so they looked like they were floating. All different sizes and colors. Woke up and tried to figure out how to make something like that. They were not pieced together. It was all one with no seams. The next night I dreamt I was vending at a hotel. I do this a lot. Sometimes I do my booth layout in my sleep. At least the carpet was tasteful at this dream hotel. The proportions were all wrong in my dream. Every hotel room was a perfect cube. Ya know, it's one thing to setup in a 10' x 10' EZ up and another to vend indoors with 2 or 3 six ft. long tables. I wonder if that was what was bugging me. We had just been talking about Greek aesthetics and proportion and how much its influenced what we like. My companion had noticed that the Mormon temple in Oregon did not use the Greek proportions and so it looked wrong to her. That still doesn't explain my fixation with cubes. It was really hot last week. Maybe I was trying to tell myself to make ice cubes? I think the danger of frost is over. 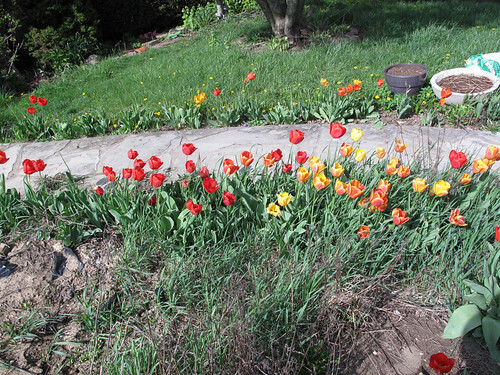 The front yard tulips are done blooming. Time to do crab grass removal while the clay is loose from rain. I moved my rhubarb because it wasn't doing well. I have it all in a line now. 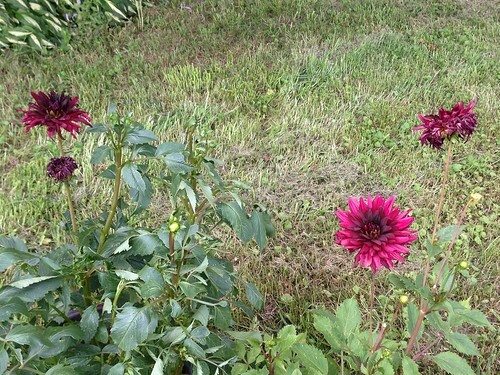 I put in some pinks from the Italian grocery store and moved the free range calendula that occupy my yard. What I need is more compost. That clay will break another spade if it doesn't get something. I dug in every last leaf I could find and all my vegetable scraps. Not nearly enough. While moving the rhubarb, I found clay pure enough to make pots with. I dug crab grass by hand yesterday. I like to pretend that I'm harvesting spaghetti noodles out of the ground. It makes me hungry but I get a lot done. 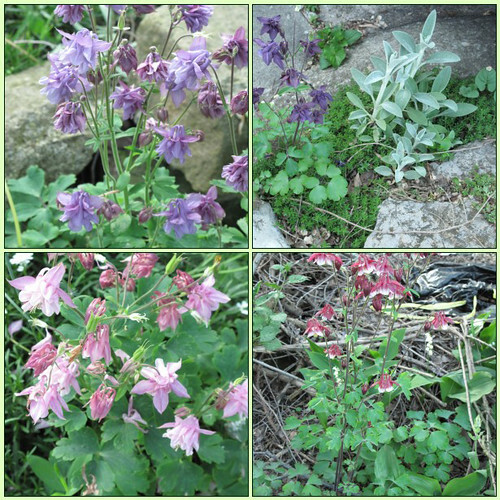 The columbine are blooming and the lilacs and the lily-of-the-valley too. I've been struggling to remove the walnut treelings that the squirrels have planted in bad places. Those squirrels know how to dig deep! Today the raised bed gardens got more stuff planted in them. I took some old screens to put on top until the plants sprout. A stray cat dug up some of my peas while using my garden as a litter box. I know I need compost but not that fresh please. So far I have carrots, kohlrabi, parsnips and beets with a few peas planted. In the second bed, I have my heirloom beans, Vermont Cranberry, king-of-the-early, and Jacob's Cattle (maybe). Radishes went in among the beans to prevent bean beetles. The only thing up so far are the peas. Still have one more square to plant. Probably more beets. 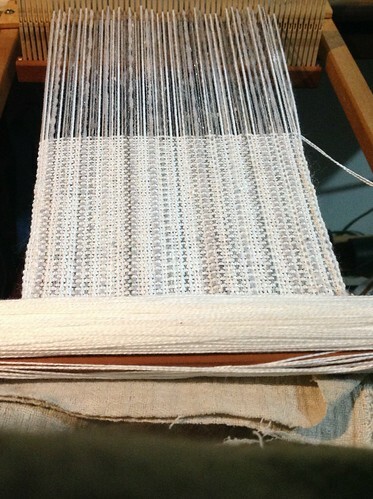 Despite the cuts and blisters from weed removal, I've been making progress on my weaving for this weekend's show. I don't have a lot but then, the show only runs 5 and a half hours. 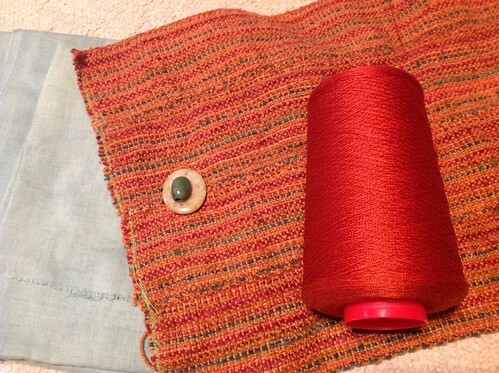 I'm working on bags and the muskmelon scarf. If nothing else, I'll have more product to put in the etsy store. I'm pleased with the results so far. It's hard to work with the garden calling. I want to play! I found myself wide awake and dis-oriented at a very early hour. Not sure what woke me, but when I came back into myself, the world was sideways. I lay for a long time trying to figure out where the door was before getting up. It was very dark. Couldn't get back to sleep but didn't want to wake anyone. I waited until I heard the outside birds and then found my sweater. My husband couldn't sleep either. I went up into my studio and read the e-paper. And eventually started working on a shawl. I just put in an application to do an art show in May. Guess I should work on product. I am so far behind. I worked on a bag yesterday but I need to free up my strap loom first. All that inkle weaving is hurting my wrist. I do a lot of "There's a Hole in My Bucket". Can't finish the bag because the inkle loom isn't available. Can't finish the inkle project because of something else. Can't finish something else because . . . There's a hole in my bucket, dear Liza, a hole. 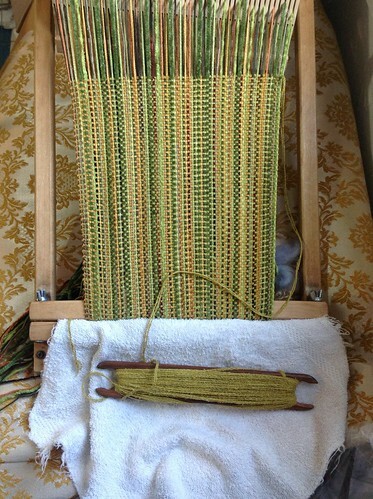 Today I got in three good hours of weaving. Got my application mailed for the art show. Emptied a little more of the van. Watered the raised bed. I planted snow peas and spinach. It hit 50 degrees today. Planned more shawls after this one's done. 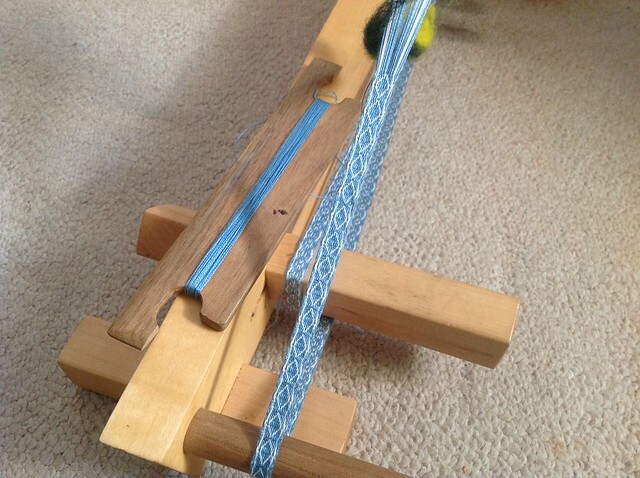 May start threading the 24" loom heddle tonight and get warping started tomorrow if the weather's nice. That loom is in the garage. The warp's in the dungeon and the heddle's in the attic. Lots of exercise running up and down steps in my life. 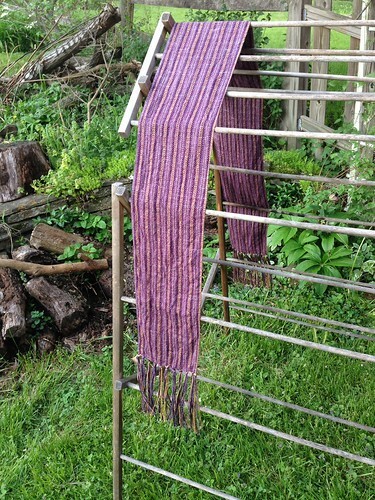 It'll be three or four days of weaving to get the purple shawl done. Then comes washing and blocking but I want it done before I leave for Oregon. And Oregon is to blame for my poor night's sleep. But that's a story for another day. Made a dent in the inventory today. Went through several baskets of yarn. 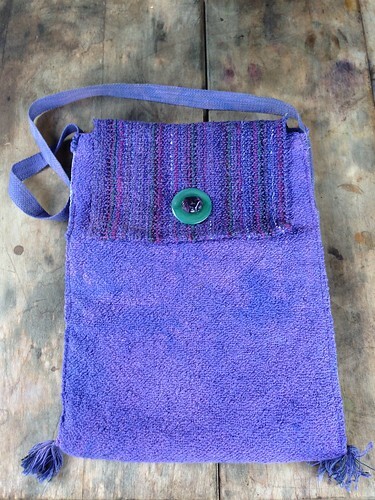 Got some weaving done and started stitching a bag. Going to be about 8.5" wide and 12" long. Need to figure out where my interfacing went. 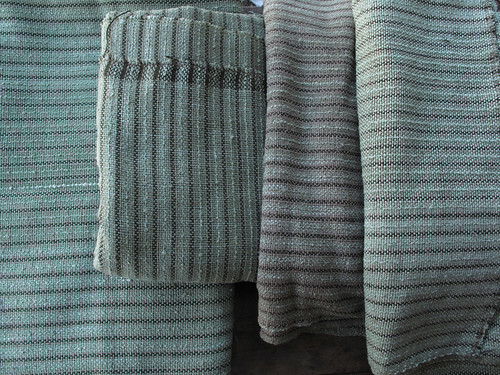 Not sure if I have enough fabric woven for a handle. I don't have anymore of this color so I hope so. Chased in to Pgh to get groceries. I hate going that far and buying so little. I've never seen a store that busy. Got fixings for Chinese beef and peapods. My stomach is perfectly fine as long as I don't eat sugar. So rice is my primary staple. Chinese food is on the menu. Managed to unpack the van from the show we did in December. Since it was in the sixties or seventies today and the ice was gone, why not? Its very difficult loading on snow and ice on a steep steep hill that is our driveway. Managed to pre-load for ValDay. Everything that's inventoried is ready to go. Now for the things not inventoried. I have two tubs of merchandise and the heather yarn to do as well as the socks. The socks will be the worst of it. I have a huge selection still and they all gotta be counted. Errands to run in the morning so off to bed. So I was working on a design late last night until 2 am. I figured every detail out, how much yarn I'd need, colors, how to go about making it, everything. My muse was sparked by a lady I've met numerous times. We just call her the weaver from Yellow Springs. Everyone knows her. She does renaissance fairs. Long ago she was kind enough to talk to me about some of the fairs. Well, Wild Fiber Magazine did a feature interview with her. Looking at her color palette is always inspiring. She plays with the whole rainbow and quite well. Well, it was inspiring. It got my creative juices flowing and they won't stop. Must turn brain off somehow. I got one design sketched out. Jennifer and I went over this year's color palette. I have been wanting to do some jackets for a long time. Got that design all pinned down. 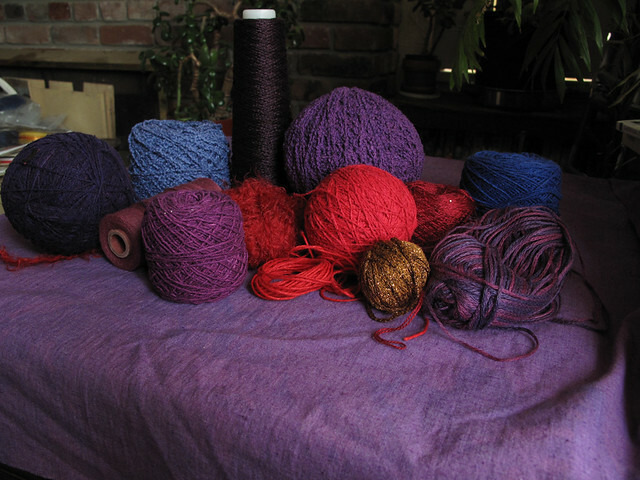 Picked out yarns and dyes. Ready to start some trial pieces once this shawl is done. Finally got to sleep, but woke up way too early with more ideas I needed to try. I got out a little granny square peg loom and a basket of yarn. 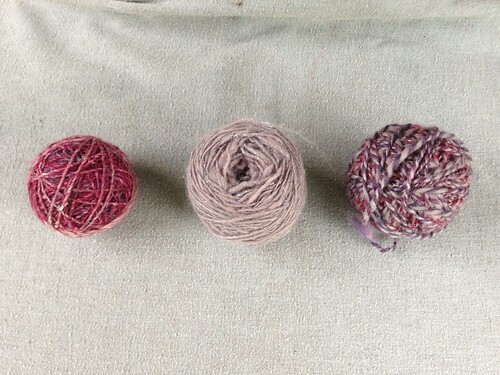 Yesterday I'd been pondering what the heck to do with the Berrocco Suede yarn I was given in a dusty rose. I poured over Ravelry yesterday. I didn't like the knitted items but woven was okay. I had no other colors to mix it with and I'm not interested in buying more of the stuff. So I had an idea about a textured shawl where each square is a different material. Well the suede turned out nice but took a whole hour to do one 6.25" square. 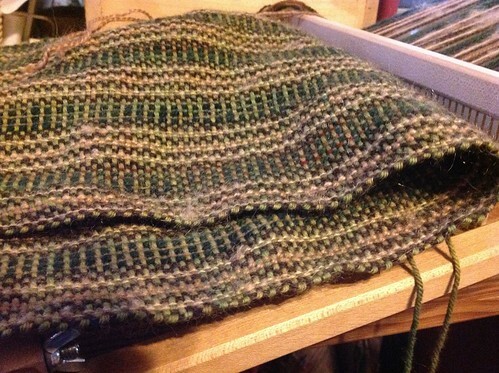 A proper shawl would need 48 squares. I am not about to spend 48 hours on a shawl that I can only get $150 for at best. Got that out of my system. I also did a second square out of a cotton boucle. Just in case the Suede was fussing and took me longer than it aught. 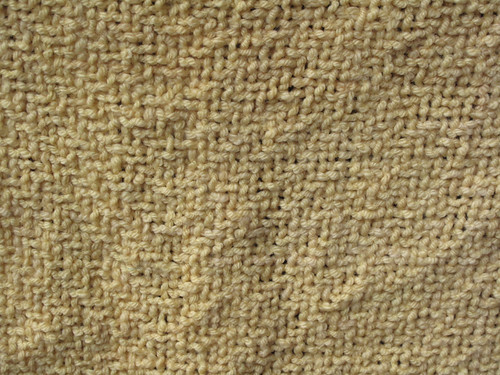 The boucle took just as long and was an inch larger than the first square, owing to the stretch in the suede. Concept failure. That's why we do prototypes. Finally got that out of my system. Now I'm tired and useless. I made a bit of lunch and seriously attacked the kitchen. Did bunches of dishes, cleaned surfaces, etc. Jen is working on a roast and while that cooks, I need to attack apples. Must start canning. Gonna make some apple butter. Hopefully will go to bed early without more inspiration that I can accomplish in a day. Yesterday was very productive. I don't know that I could manage that again. I got many many things done. I did the normal mundane things that had to be done. I got some time in to run a dye bath. Wanna see? So I'm playing with dark greens to see if I can manage it. I got wool carded yesterday and also spun some. I even got to knit night and made some progress on May's socks. (part of the Ravelry 12 for 12 socks in 2012). more on that in another missive. Today I need to focus on my backlog of special orders. Gotta get some hats done and a small loom warped.